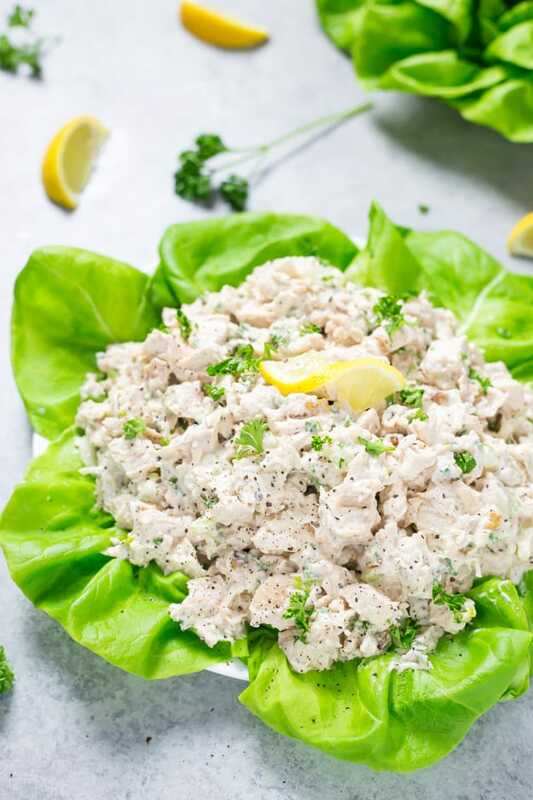 This easy low carb chicken salad recipe doesn’t disappoint and is low carb and keto friendly! It’s creamy with the perfect balance of chopped walnuts, celery, and has the juiciest chicken chunks ever. Chicken salad has always been one of my favorite things ever. I like to prep a large batch of it during the weekend, so I can lunch all ready to go, especially when you are eating low carb and doing the keto diet. It’s so easy to fall off the wagon when things are prepped and ready to go, I know for me it is! This chicken salad recipe is legit because it has the crunch factor that you are looking forward to in chicken salad. Read below to find out the two things I always add to my chicken salad to keep it low carb while having a little extra crunch with each bite. So why am I calling this an easy chicken salad recipe? The longest part of this recipe is baking the chicken breasts, and it’s not something you want to skip and purchase a rotisserie chicken for, I promise. You will learn how to make the juiciest chicken breasts ever in no time; I’m talking 20 minutes – 15 minutes baking and 5 minutes cooling down. You can easily have this prepped and ready to go in under 30 minutes or less! I suggest purchasing top quality chicken breasts. 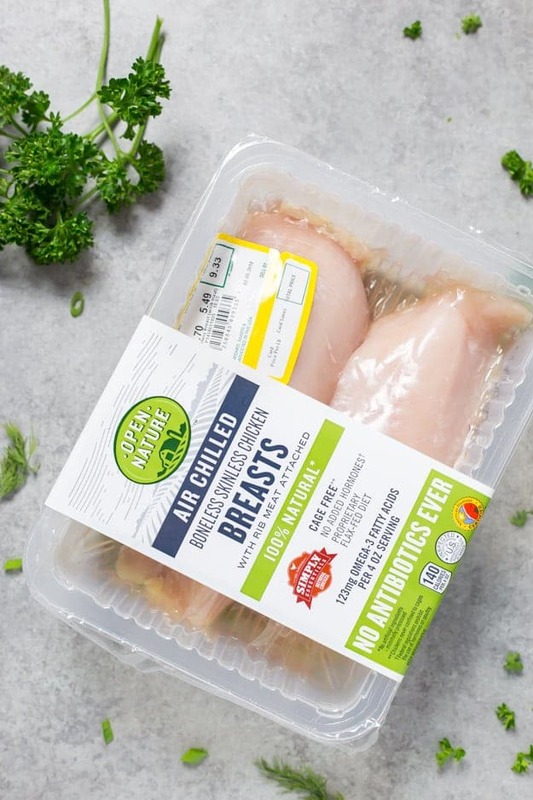 We love to use Open Nature products, and when I saw our the new Open Nature® Air Chilled Chicken at my local Safeway in Woodbridge, I grabbed them and decided to give them a try. They do not disappoint! We love the air chilled chicken because the chickens are individually processed with purified air for 100% mouth-watering flavor. To make this easy, like the recipe states, I highly recommend getting the chicken done, and in the oven, so you can prep your other ingredients. Once the chicken is in the oven, I like to wash my vegetables and pat them dry. I then prep my celery and make sure you do not throw out the celery leaves, that’s where the most flavor is! In my chicken salad, I like little pieces of celery, but you can prepare it, however, you and your family like. I love to purchase already chopped walnuts to make this chicken salad recipe a breeze. 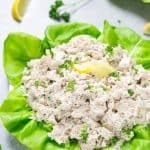 What to serve with your low carb chicken salad? Most of the time I like to enjoy my low carb chicken salad with celery stalks, cheese crisps (baked cheese), or even on top of lettuce (romaine and butter lettuce are perfect). If you are looking to add a little more fat to your meal, I like to have a few slices of cheese on the side. Mmmmm. Any type of cheese is my favorite, not picky here, well, besides blue cheese. 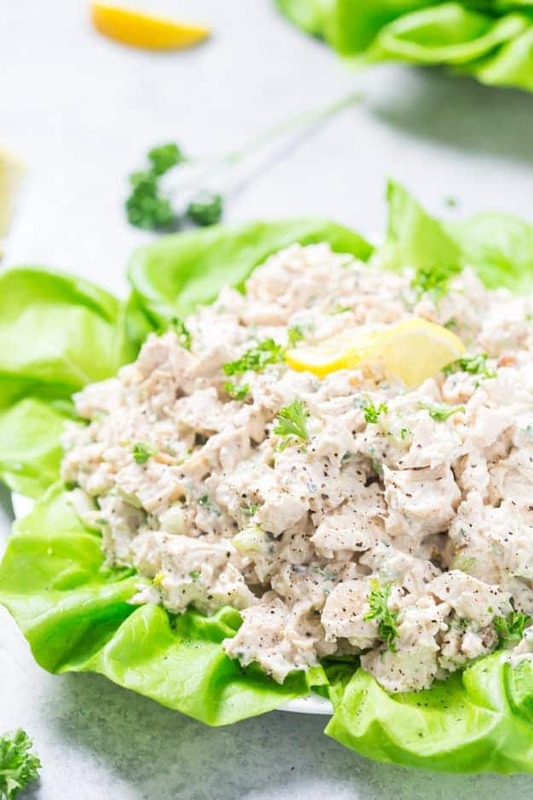 This easy low carb chicken salad recipe doesn't disappoint and is low carb and keto friendly! It's creamy with the perfect balance of chopped walnuts, celery, and has the juiciest chicken chunks ever. Preheat oven to 450 degrees F. Place the seasoning in a small ramekin and mixed together. Place chicken breasts breast side down and season one side, then season the high side. Bake for 18 minutes. Remove the chicken breasts from the oven and cover with aluminum foil and bake for another 5 minutes. 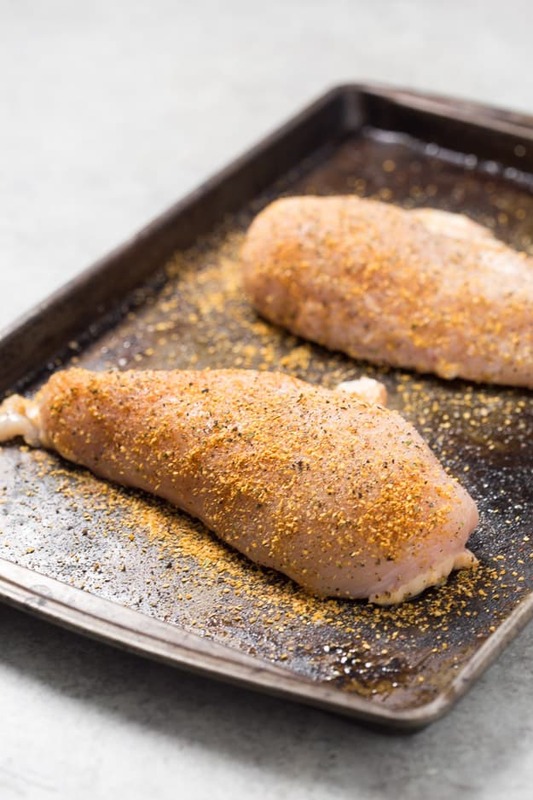 Remove the chicken breasts from the oven and allow them to cool until you can easily touch them. Dice the chicken breasts into bite-sized chunks and place into a medium-sized bowl. Add the celery, walnuts, mayo, sour cream, dried chives, garlic powder, fresh parsley, lemon juice together until combined and season with salt and pepper, to taste.